The Signia Siemens Signia Cellion Primax offer true freedom and flexibility when it comes to rechargeable hearing aids. The Cellion Primax is the world’s first lithium-ion inductive charging hearing aid. Cellion can provide 24 or more hours on a single 2 to 4 hour charge, 7 hours on just a 30 minute charge. Because Cellion charging is inductive (wireless) there is no need to worry about contacts or precise placement in the charger. People who keep irregular hours, travel often or just like the freedom of not having to charge their hearing aids for a couple of days, will find the Signia Siemens Cellion Primax the ultimate in rechargeability and listening quality. We have been offering Siemens Primax technology since March 2016. It has been extremely successful with our patients. Several clinical studies prove that Siemens Primax technology is better than normal hearing in difficult listening environments. It also reduces cognitive load. Difficulties in hearing speech increases cognitive load and is linked to dementia and Alzheimer’s. For those worried about moisture, dust or debris fouling your hearing aids Cellion Primax eliminates your worry. Cellion Primax is IP 68 rated and the hearing aid can be immersed in 3 feet of water indefinitely. Learn more about the Cellion Primax. We offer 7-day demonstrations with no cost and no obligation. We provide you with a free thorough hearing exam and then we program the hearing aids for your hearing loss and particular requirements. Use the hearing aids in your listening environments around your family, friends and coworkers. When your demonstration period is over, just return them and there is no commitment nor cost. Buyer Beware: Personal Amplifiers are not hearing aids. We have been asked about recent ads from hearing aid chain stores that are offering what appears to be hearing aids for around $499.00. Note that the ads do not use the words “hearing aids” they use “personal amplifiers” or “personal sound systems” as the terms to describe their devices. Personal Amplifiers or Personal Sound Systems just amplify sound and are not capable of being programmed for a specific hearing loss. There are essentially similar to the electronic devices that you can find at a hobby store for about $29.00. They are intended for use by people with normal hearing and be used to amplify the sounds of a forest or to better hear your next-door neighbor’s argument and other nonessential listening. People that have become our patients after visiting one of these hearing chain stores have told us that the process is something similar to this: Once the hearing aid chain store finds that you have a hearing loss, the Personal Amplifiers or Personal Sound System is off the table. Now what is on the table is a set of overpriced hearing aids in the range of $5,000 to $6,000. 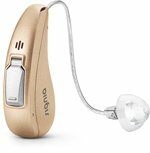 These hearing aids are often available elsewhere in the range of $2,500 to $3,500. They are hoping that once someone comes into their office for the $499.00 offer and they will be able to apply enough pressure to make a sizable profit on real hearing aids. The release of BINAX from SIEMENS brings clinically proven better than normal hearing in demanding listening environments. e2e wireless 3.0 enables each hearing aid to take in sound through 4 microphones, creating an 8 microphone HD system. Sound is transferred wirelessly from one hearing aid to the other allowing the wearer to hear the exact speech sounds in stereo. A new Bluetooth remote called EasyTek is discreet and can be concealed beneath a blouse or a shirt. Siemens chose to make the EasyTek a wired remote to maintain signal connectivity without dropping sound. The EasyTek can be paired with telephone, t.v., or any Bluetooth listening device. It is also designed to be used to narrow directionality so you can focus and understand just one person. In an environment with many people you hear only what you want to hear. The EasyControl app, used with your smartphone can be downloaded FREE and works simultaneously with the EasyTek. The app allows you to discreetly make volume changes and engage Binax technology called a Spatial Configurator. With just a touch you can change polar plots to can aim your instruments like a laser beam in any direction to focus on only one person. With an IP67 rating you don’t have to worry about your hearing aids failing if you step into the shower, sweat, work in dust or are caught in a rainstorm. Binax Carat holds a size 13 standard battery. Charging your hearing aids every night is an option with Siemens eCharger. Call Northwest Professional Hearing, 877-600-1122 to learn more about Siemens Binax technology and how it can help improve your life. Most of us associate hearing loss with retired folks or our grandparents. It has to be a problem we’ll deal with when we get old. Attention has recently been focused on hearing loss in young people associated with wearing ear buds and listening to loud music with an iPod or MP3 player. Loud music pounding against the tympanic membrane from a distance of just a few millimeters is certainly going to accelerate the progression of hearing loss. You may believe you’re safe if you’re not one to listen to music using ear buds but research has shown that there are many other factors that affect your hearing. Listen to this! According to the National Academy on the Aging Society nearly one out of four people who suffer from some degree of hearing loss are between the ages of 18 and 44. That is a shocking statistic. Image the reaction if the same percentage was attributed to another disease. Here are a few of the surprising contributors to hearing loss unrelated to age. Allergies – Some people notice that their hearing seems to digress during the spring or fall. Douglas D. Backous M.D., medical director at the Center for Hearing and Skull Base Surgery at Swedish Medical Center in Seattle states that swelling or increased wax accumulation associated with high pollen levels can be the cause of decreased hearing. Using decongestants or antihistamines helps alleviate these symptoms. In these cases, a drop in hearing levels should theoretically be temporary. OTC Pain Medication – A study in the American Journal of Epidemiology found that women who took acetaminophen or ibuprofen two or more days a week had an increased risk of hearing loss. Aspirin and some other pain relievers are vasoconstrictors – restricting blood flow to the cochlea nerve. Research also shows that taking higher doses of aspirin or other non-steroidal anti-inflammatory drug painkillers can cause tinnitus – ringing in the ears. High Blood Sugar – A diagnosis of diabetes under the age of 60 increases the risk of hearing loss by 2.6 times. High levels of glucose are known to damage the eyes and kidneys. It is suspected that these increases may also affect blood vessels in the inner ear where the cochlea nerve is located. Americans with pre-diabetes, numbering 79 million have higher rates of hearing problems. If you notice the need for increasing the volume on your TV or iPod it’s a good idea to ask your doctor about getting a blood sugar test as well as a hearing test. Smoking – Tobacco smoke as well as secondhand smoke irritates the Eustachian tube and the lining of the middle ear. This irritation can eventually contribute to hearing loss. This type of hearing loss can be more gradual and is most likely noticed first by friends or family members. Some damage may be permanent but quitting the habit and avoiding situations with secondhand smoke can prevent further decline in your hearing. As a hearing healthcare professional I want all of my patients to wear their hearing aids, enjoy every minute of each experience and forget they have instruments in their ears. Wearing hearing aids consistently is the key to maintaining the central processing that occurs in the brain when you hear. hearing. Measuring this process is difficult because each person has a different rate of acceptance. The wearer must remember that patience and consistency is the key to success. making other sounds intolerable. Three key features of Micon provide the perfect balance between sound quality and effective audibility helping the wearer adjust during this process of relearning. miSound, miFocus and miGuide work together to produce maximum spontaneous acceptance, long-term listening satisfaction and natural sound that fits the wearers needs. miSound allows the wearer to forget they are hearing through hearing instruments. It offers the most natural and comfortable sound possible. miFocus uses Siemens new 48 channel TwinMic system o make hearing effortless. This system localizes and suppresses noise, offering more speech intelligibility even in the most challenging environments. miGuide is a powerful engine that offers the wearer customized sound. It employs automatic situation detection. It learns user sound preferences and has an automatic gain adjustment. This feature increases the gain over time while the wearer becomes accustomed to the new amplification and smoothly adapts to how the wearer wants to hear. There has never been a better time to begin hearing again. With the perfect balance between sound quality and effective audibility you can’t lose. Hearing loss as it relates to brain function and cognitive ability is far more complex than we realize. To clarify; cognitive ability is being conscious of intellectual activity (as thinking, reasoning, remembering, imagining or learning). The medical community has known for quite some time that sound is processed in the brain. Hearing loss alters the auditory signal to the cognitive system. When the auditory signal does not reach the brain the consequences can be devastating. Hearing loss creates a domino affect that results in increased cognitive load, decline in memory, increased mental fatigue, lack of focus, poorer mental health, withdrawal from social situations and depression. It becomes emotionally exhausting to participate in conversations and interact socially when one is concentrating to keep up with what is being said. Many people with hearing loss become “lazy” and don’t pay attention to others in a conversation. Others just withdraw from social situations all together because of the effort required to hear and listen. Most people don’t want to ask others to repeat and feel stupid when they misspeak. The result is that they change their lifestyle to eliminate social interactions. Your ability to process speech diminishes commensurately with the digression of hearing. According to The Hearing Review, September 2012 Dementia is one of the most important public health issues facing our society. It is estimated that the prevalence of dementia will continue to double every 20 years. One in every 30 Americans will be affected by dementia by 2050. It is also known that as people age the speed with which they process information declines. Memory capacity as well as focus and attention can make speech understanding a challenge. Hearing aids are specifically prescribed and programmed to each patient’s needs. Hearing well isn’t just a shot in the dark. Proper amplification improves the auditory signal being sent to the brain and eases cognitive load. Hearing aid technology has significantly improved audibility and speech intelligibility even in the noisiest situations. While hearing with hearing instruments will never be perfect, manufacturers have created circuitry that is highly intelligent. Hearing aids can track and monitor your environment. They will make decisions based on where you are, what you are listening to and how much noise is present. Some hearing aids are “trainable” meaning that you can make adjustments to the sound in a particular environment and your instruments will remember those adjustments. Once trained, they will automatically adjust. One of my patients told me that he loves his hearing aids. He said, “These are great. The volume automatically goes down when my wife starts yelling at me”. We have had a blog for several years. A few weeks ago our blog disappeared under mysterious circumstances. Yahoo has indicated that they can not restore anything from our previous blog. We apologize to all those who participated in our blog. The blog is currently being rebuilt and should be back online soon. We invite all those who participated before to participate again.